[176 Pages Report] The automated guided vehicle (AGV) market was valued at USD 1.71 billion in 2017 and is expected to be worth USD 2.74 billion by 2023, at a CAGR of 8.02% during the forecast period. The base year considered for this report is 2017, and the forecast period for the market has been considered from 2018 to 2023. The objective of this report is to define, describe, and forecast the market size and growth potential of the AGV market across segments such as type, navigation technology, industry, application, battery type, and region. It includes the estimation of the market size, in terms of value, with respect to 4 main geographies, namely, North America, Europe, APAC, and RoW. 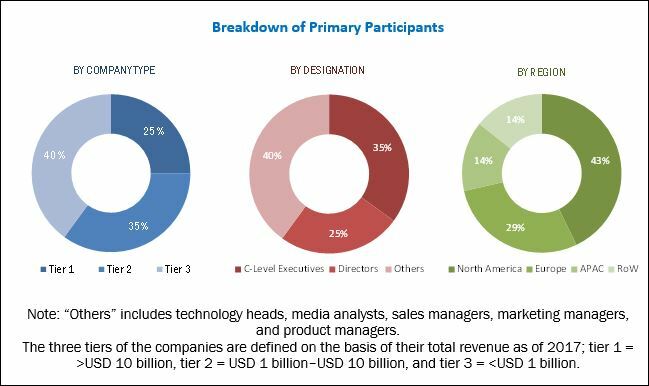 The study identifies and analyzes the market dynamics, such as drivers, restraints, opportunities, and industry-specific challenges pertaining to the market. It also profiles key players operating in the AGV market. The growth of this market is driven by the factors such as the growing demand for automation in material handling across industries, emerging e-commerce industry, rising requirement for workplace safety standards, and growing productivity owing to improved supply chain processes. The value chain of the overall AGV market includes various activities and factors that help achieve a high level of performance, with respect to a service or product. Daifuku (Japan), JBT Corporation (US), KION Group (Germany), KUKA (Germany), Toyota Industrial (Japan), Hyster-Yale Materials Handling (US), Kollmorgen (US), EK Automation (Germany), Seegrid Corporation (US), and SSI Schaefer (Germany) are among a few key players operating across the value chain of the AGV market. Daifuku exhibited several of its new 3D virtual reality materials handling solutions at ProMat 2017. The company’s kiosk showcased products including robotics solutions, conveyor and sortation, mini-load shuttle, and other material handling models. EK Automation launched its new freely navigating vehicle ECO L03-05, equipped with a maintenance-free Li-ion battery. The ECO L03-05 is a weight-optimized vehicle and has optional stabilizers for the transporting goods up to 500 kg. KION entered into a strategic partnership agreement with EP Equipment (China) to acquire a minority stake in EP Equipment. This partnership is likely to help KION in expanding warehouse equipment offering in China and across the world. Seegrid entered into a partnership with Bell and Howell (US), a leader in connected self-driving vehicles for materials handling, to provide technical service and support in the North American market. Hyster-Yale entered into a definitive agreement to acquire Zhejiang Maximal Forklift Company (China), forming Hyster-Yale Maximal Materials Handling. This strategic move is expected to enhance the global manufacturing capabilities of the company. It will also give Hyster-Yale access to competitive component sourcing and strengthen its utility and standard product portfolio. Toyota Industries signed an agreement with Vanderlande Industries (Netherlands)—the global market leader for value-added logistic process automation—to acquire 100% shares of the company. The acquisition is likely to strengthen Toyota Industries’ materials handling solutions business. The company established its new technology center in China. KION announced the expansion of its production capacity with a new plant in the Czech Republic. The new production plant is expected to expand the automated conveyor systems offering of the recently acquired automation specialist, Dematic. According to MarketsandMarkets, the automated guided vehicle (AGV) market is expected to grow from USD 1.86 billion in 2018 to USD 2.74 billion by 2023, at a CAGR of 8.02% between 2018 and 2023. 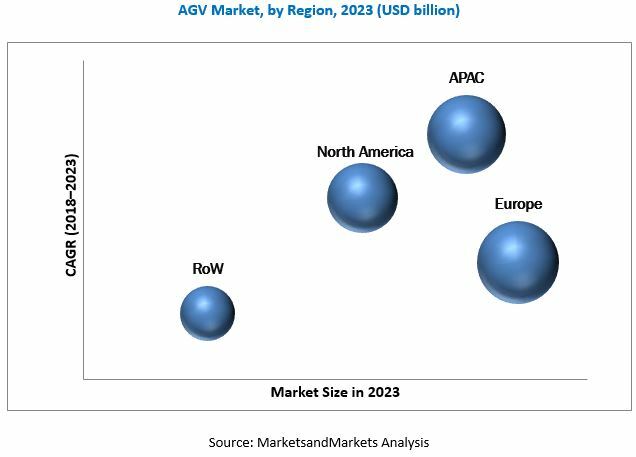 The major factors driving the growth of the AGV market include the rising demand for automation in material handling across industries, emerging e-commerce industry, increasing requirement for workplace safety standards, and growing productivity due to improved supply chain processes. In this report, the AGV market has been segmented on the basis of type, navigation technology, battery type, application, industry, and geography. On the basis of type, tow vehicles accounted for the largest share of the AGV market in 2017. The tow vehicle, also known as tugger, pulls non-powered carts carrying heavy loads. This is the most productive AGV used for towing and tugging as it can move heavy loads with multiple trailers than a single fork truck. The tow vehicle has the ability to automatically pick up a load without any human interface, or loading/unloading can be done manually. Tow vehicles are used for pallet operations requiring frequent long-distance deliveries carrying high volumes of the load. Laser guidance technology accounted for the largest share of the AGV market, based on navigation technology, in 2017. Laser guidance is the most flexible system for vehicle movement and offers accurate navigation. It has reflectors mounted on walls along the vehicle’s route. Onboard AGV is a rotating laser light beam source that detects its reflections and receives information on distance and angle, which gets stored in the vehicle memory. The AGV can calculate its position based on this information. On the basis of battery type, the lead battery accounted for the largest share of the AGV market in 2017. The lead battery is a mature energy storage technology used in the conventional automotive and power sectors. It is the oldest type of rechargeable battery and is most suitable for automated guided vehicle applications. Lead-acid batteries are generally used in AGV systems as these batteries have the highest power-to-size ratio in comparison with conventional batteries. On the basis of application, the transportation application accounted for the largest share of the AGV market in 2017. Transportation systems rapidly and efficiently connect the receipt of goods, production, order picking, and material shipment within the plant. They also aid the movement of goods around a warehouse to improve material handling efficiency and productivity while maximizing profits. AGVs are widely used for automatic transportation of materials from one location to another, which maximizes productivity, reduces costs, prevents infrastructure damages and accidental injuries, and optimizes space. On the basis of industry, the automotive industry accounted for the largest share of the AGV market in 2017. The automotive industry is enhancing its manufacturing operations through automated, efficient, and effective processes. Automotive suppliers have made rapid progress in automotive storage with innovative product technologies and by enabling real-time information for the efficient delivery of high-quality products. Currently, the AGV market is largely dominated by Europe because of the exceptionally high labor cost in this region. Europe held the largest share of the global AGV market in 2017, while APAC is the most promising region for the AGV market, and the market in APAC is expected to witness the highest CAGR because of the region’s fast-growing e-commerce industry, a booming manufacturing sector, and numerous planned installations of AGVs in emerging economies such as China and India. The low labor cost in emerging countries and real-time technical challenges may create more problems for the manufacturers in the AGV market. Daifuku (Japan), JBT Corporation (US), KION Group (Germany), KUKA (Germany), Toyota Industrial (Japan), Hyster-Yale Materials Handling (US), Kollmorgen (US), EK Automation (Germany), Seegrid Corporation (US), and SSI Schaefer (Germany) are among a few major vendors in the AGV market. These players adopted strategies such as product launches and developments, contracts, acquisitions, partnerships, and business expansions to satisfy the needs of the customers in the market. There is a demand for increased efficiency in emerging industries such as automotive, healthcare, e-commerce, and food and beverage are demanding, leading to increased demands for automation. The automation of industrial facilities with the help of automated guided vehicles (AGV), automated conveyors, pallet trucks, assembly line vehicles, and robots that can help in fulfilling requirements related to material handling capacity, results in reduced production time, fewer chances of human error, increased safety, high production volume, and increased accuracy and repeatability. According to the International Federation of Robotics (IFR) (Germany) “By 2019, more than 1.4 million new industrial robots will be installed in factories around the world”. The growing popularity of online shopping is the key exponential factor boosting the growth of the e-commerce industry. E-commerce companies such as Flipkart (India) and Amazon (US) are extremely popular among online shoppers; thus, they need to stock up large volumes of products in their warehouses. E-commerce companies also need to offer order accuracy, same day or same-hour delivery, and free returns to compete in the market. Thus, e-commerce companies are constantly looking for economical ways to reduce their delivery times. Automated material handling equipment such as AGVs, ASRSs, automated conveyors, and robots have emerged as comprehensive solutions, gaining popularity among e-commerce companies, helping them handle order fulfillment processes efficiently. For instance, the acquisition of Kiva Systems (US) by Amazon (US) revolutionized the use of robotics in fulfillment centers of online retailing companies. In 2016, Amazon increased its fleet of warehouse robots by adding 15,000 robots to the existing fleet in its fulfillment centers. The total number of robots operating in Amazon’s warehouses was 45,000 by the end of 2016. Traditional industrial facilities are slowly evolving into smart, connected, and highly efficient automated facilities by integrating Industry 4.0 with automation systems. The Industry 4.0 trend is capable of influencing the industries significantly with its ability to convert an industrial facility into an autonomous plant. The Industry 4.0 will combine computers and industrial automation solutions in an ultimate dimension with robotics; this network of connected devices will create a smart architecture capable of taking decentralized decisions. The initial cost of an AGV solution is high (depending on the integrated battery type and navigation technology) and mostly large-scale industries can afford these solutions. Small and medium-sized enterprises (SMEs) find it difficult to adopt industrial automation technologies, the initial high cost being a prohibiting factor. Factors such as rising labor costs (in developed economies like the US), quality concerns, and limited skilled workforce hinder the growth and profitability for these SMEs. However, despite the high initial capital investment, SMEs are moving toward automated warehouse operations as these help them compete globally with bigger market players.